If we had gone with a custom kitchen this kind of element would have been easy. But when you’re working with big box cabinets, something like this takes a wee bit of “hacking”. The easy way to create a shelf would be to put up an Ikea cabinet in that space above the sink and just leave the doors off. The problem with this method is that you would see all of the fronts of the cabinet`s walls and also all the holes on sides that are supposed to allow for adjustable shelves. In our case this way defeated our hope of making our Ikea kitchen look custom. So although it was the easy route, it wasn’t the right route for us. Before diving into the instructions, I wanted to show you a diagram that shows the basic measurements that we were working with. This will hopefully help you with understanding the instructions that follow. Keep in mind that your measurements will differ as each home has different ceiling heights. You need two larger cabinets [Fig A and C shown below] on either side of a shorter upper cabinet [Fig B]. We used the tallest cabinets possible for our main cabinetry [A and C], as our ceiling height allowed for it. You don’t order any additional cabinetry for beneath the middle (shorter) cabinet [Fig B]. The shelf itself is nothing other than an Ikea cover panel. Cover panels are sold for the purpose of adding to the end of cabinets. The cover panels were the perfect colour – they are made to match the colour of your cabinetry (so no extra painting required) In addition to being the right colour, they were the right depth as they are already designed to fit the depth of cabinetry. We cut both panels to the right width which was 30 inches in our case (the width of the cabinet in figure B above). One panel was attached to the bottom of the upper cabinet to hide some of those fasteners that are exposed on Ikea cabinets. This was done by screwing down from inside the top cabinet with the right length screws (too long and they`d show and ruin your custom look, so be careful there.) The other panel became our shelf. One thing we didn’t account for was that these cover panels are not very sturdy because they aren’t very thick. In order to make sure the shelf didn’t sag in the middle because of the weight of the cookbooks we used a solid piece of wood (1×2 inches that was not finger-jointed) as our valance. Since we had chosen a valance profile that was more traditional and not from Ikea it worked very well and added to the overall custom look. If we had chosen an Ikea valance (that also wouldn’t be too sturdy) we would have had to add in a supporting beam behind it. Aubrey and I held up books that were the size we needed the shelf to hold and made sure they`d fit and that there was enough space above them.The space that we ended up with (the height of the inside of the shelf, ended up being 15 inches. As for the back of the shelf, you have a few options. You could extend your backsplash up so it becomes the backdrop for whatever you put on your shelf. However we elected to go with another cover panel that was a bit larger that we cut to the right size and glued to the wall with PL. 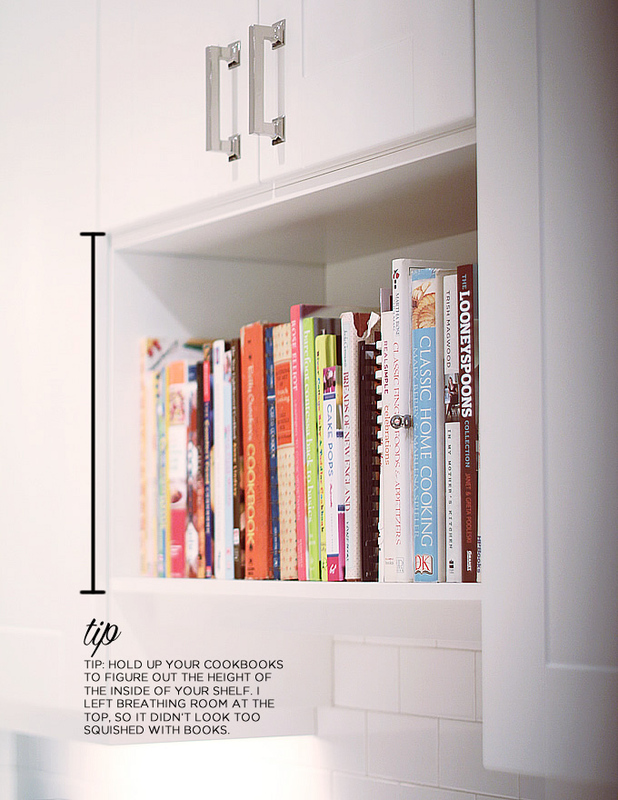 Although you can hardly see it, it`s that little detail that makes it seem like custom built cabinetry.